Titrations are the symbol of all that is boring in science. Yet they are among the easiest visual ways of asking the question: how much of substance X do you contain? Unusually for analytical chemistry, titrations can give you a direct answer - X’s volume - but it took several inventions to perfect the art we now take for granted. Chemistry only really became a quantitative subject when researchers had the bright idea of using sensitive balances to weigh materials and products. Suddenly much of the mist surrounding the subject cleared: it was not long before Joseph Proust had established that compounds contained elements in fixed proportions, a law neatly rationalised by John Dalton’s atomic theory. Determining the composition of ores and compounds was all the rage. As the chemical industry grew, analysis played a central role in consumer protection, for fraud, food adulteration, and even poisoning were rampant. But the most reliable analytical methods were gravimetric - the element under investigation was precipitated, digested, washed, and calcined to constant weight. It was never a quick process and there had to be a faster way. 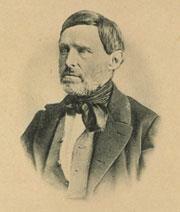 But his views were ignored - particularly by one Karl Friedrich Mohr. Born in Koblenz in Prussia in 1806, the son of a druggist, Mohr had the run of his father’s lab and proved a superb experimentalist. After studying in Heidelberg, he joined his father’s business, an occupation which gave him ample scope to do research and write books. A particular 1837 paper is still noted for apparently containing one of the first statements recognising the conservation of energy. It was at this time - still running his father’s pharmacy - that Mohr made a series of crucial contributions to analytical chemistry. He introduced oxalic acid and iron( II ) ammonium sulfate (Mohr’s salt) as primary standards for acid/base and redox titrations respectively; developed classical methods for the determination of chloride and other substances; and invented the cork borer and the graduated pipette. 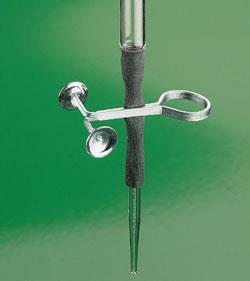 Most importantly, however, Mohr redesigned the burette. Taking one of his own pipettes, he added a short length of rubber tubing at the bottom pinched by a brass clip of his own design. Squeezing the clip, the reagent could be delivered continuously or dropwise, while the scale could be read at a glance. Multiple samples could be analysed much faster. When the device appeared in Mohr’s revolutionary textbook Lehrbuch der chemisch-analytischen Titrirmethode of 1855, which ran to at least 11 editions, the modern titration was born. Within a few years all trace of Descroizilles’ and Gay-Lussac’s devices had vanished. When his father died in 1841 Mohr took over the business and ran it so successfully that he sold it in 1857 and retired to the country. But he lost his entire fortune in 1864 when his son-in-law’s vinegar factory failed. Mohr had to go back to work, becoming a junior lecturer (privat-dozent) at the grand old age of 60. He died in 1879 still smarting from never having been given a full professorship. His burette, the clip replaced with a tap, lives on. Undergraduates hate them. Is it coincidence that, in French, something tedious or annoying is said, in less refined circles, to "casser les burettes" - to break one’s cruets?